The Strand Course at Portstewart is a result of over a century of developments, with golf having been played on the links since 1889. Major work began on the land in the 1980s, and the Portstewart gem in its current incarnation was completed by Des Giffin in 1992. Due to host the 2017 Irish Open in early July, Portstewart is Irish championship links at its very best. 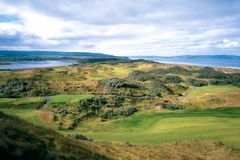 Carved among the colossal sand dunes, the golf course provides superb views across the Atlantic mouth of Lough Foyle and the Inishowen peninsula. The web of dunes that plays host to Portstewart is called ‘Thirsty Hollow', and is a truly spectacular place to enjoy a foray into Irish golf. The designer has created a number of incredible holes, and deserves credit for ensuring that the new holes assimilate subtly and smoothly with the originals. Of any, the most fascinating hole is arguably the opening hole, daunting downhill par-4 that gives an insight into the immense character of the golf course throughout. Just a few minutes from the equally magnificent Royal Portrush, Portstewart is at the heart of a magnificent Northern Irish golf tour. 2014 saw Portstewart placed at the forefront of amateur golf in its hosting of the 119th Amateur Championship. As part of the 36 hole qualification process, the links layout provided a suitable test for the world's amateur golfers. The championship was eventually won by Bradley Neil who triumphed over South African Zander Lombard with a 2&1 victory in the 36 hole final. Howling winds and hail on the first tee, but soon calmed down and reasonable weather overall. Murderous in the rough, I have played on better greens but they were fine. Clubhouse if great and staff were excellent.